Thinking of Becoming Self-Employed? Dillon Could be Your Next Partner. If you’re a truck driver looking for a unique career opportunity, you might consider becoming an owner-operator. Owner-operators typically enjoy great flexibility, compensation, and job security. In fact, it’s how many of the top trucking companies today were born. One driver, one truck and a lot of hard work can transform into a fleet of trucks and a team of drivers. 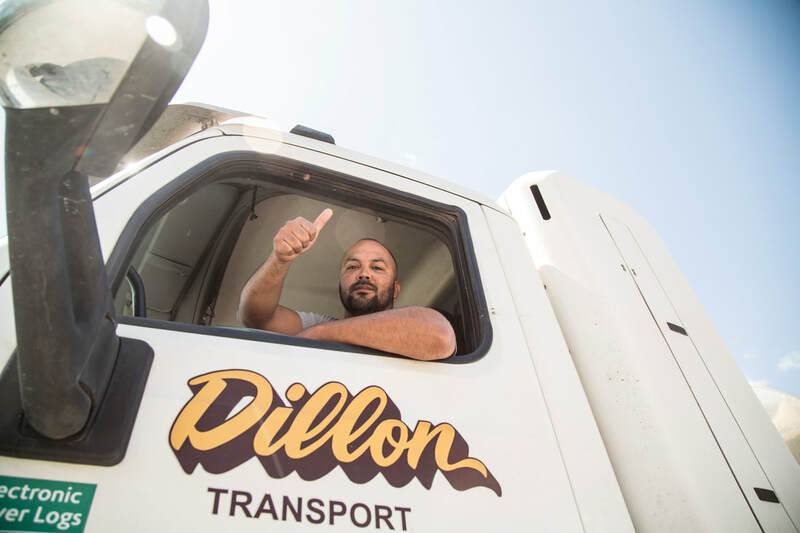 With the constant demand for drivers within the transportation industry, 2019 is flourishing with opportunities for driving professionals interested in working for themselves, and Dillon Logistics is happy to announce they are expanding to include O/O. Check out some of the following benefits of being an owner-operator. Does the idea of self-employment spark interest? Owner-operators get to lay the groundwork for their own business. Want your spouse as a co-pilot on long hauls? No problem. Have a furry friend you can’t bare to part with? Bring them along. As an owner-operator, you can do everything from establishing what kind of money you want to make by giving yourself more flexible hours to outfitting your tractor with decals and colors. Although there are more risks and responsibilities tied to being an owner-operator, ask any business owner and they’ll tell you there are numerous benefits of self-employment. We know you know that operating a tractor-trailer properly and efficiently requires expert skill and care, and an experienced, talented driver saves their company real money in diesel and maintenance costs. If you’re better than average driver, as an Owner Operator you’ll pocket more of the fuel surcharge and spend less to maintain your tractor. The most recent Truckstop.com Market Demand Index from February 2019 indicates there are about 30 loads posted for every available truck posted. The American Transportation Research Institute’s 2018 Critical Issues in the Trucking Industry report lists the driver shortage and driver retention as the first and third most critical issues, respectively. Thus, being an owner-operator means that you’ll have the flexibility to easily go where the demand is highest to maximize your profits. At Dillon, we offer 100% of the fuel surcharge, a $3,000 sign on bonus and a wide variety of lanes so you can get home more often. Manning your own small business is a lot of responsibility and hard work, but the rewards are endless. It’s not just for an elite club, either. There are over 30 million small businesses in the US alone that employ almost half of the workforce, and many of these businesses aren’t just surviving, they’re thriving. So, if you like the idea of building a business you can be proud of, something you could even pass on to your kids one day, give us a call at 863.225.4144 to learn how Dillon Logistics can be the first and best partnership of your new business. serious drivers. serious hauling. Serious safety. In an industry where safety is key all year around, it’s even more pertinent to be extra cautious during frigid months. Extreme weather can make any road unpredictable and challenge any driver’s capabilities. Sometimes staying safe simply means brushing up on a few reminders. Freshen up on some of these tips we curated from various industry news outlets. First. Check your truck. Tanks and trailers that are in tip-top shape offer better odds for safer performance. Before you depart to your destination, double-check the necessities, like tire pressure, engine oil, antifreeze levels, windshield wipers, washer fluid, mirror adjustments, etc., to verify everything is working and that your ride is ready for harsh weather. Before leaving a terminal or customer, make sure to always dislodge snow from your windshield and windows, hood, roof, trunk and lights. This may be a given, but it’s crucial that your vision is never impaired while driving. Because we take safety seriously at Dillon Logistics, we’d rather you take a few extra minutes to clear your view than put yourself at risk of danger. Once you are out on the road, the safest precaution you can take is to slow your speed and make some space. It’s the hustle and bustle that often instigates dangerous and even life-threatening accidents, especially during winter. Because traction on icy roads is poor, staying at a safe distance from other vehicles and maintaining safe speeds not only gives a buffer for breaking, but it also offers more time to react if something does go awry. “Do you know that the stopping distance on a wet road is twice the normal stopping distance? And on icy roads, it’s almost 10 times,” an article from GPSTrackit online said. Also, recognize that with frozen conditions comes thin layers of transparent ice known as black ice. Deceptively similar to water, black ice is transparent and easy to miss. According to an article by Ryder Fleet Products, the best way to pinpoint black ice is to look at your truck and surrounding terrain. If ice begins to build on the outside mirror arms, the antenna, or top corners of the wind-shield, it’s possible there is black ice on the road. If water spray from vehicles tires in front of you suddenly stops, it could mean there are ice patches on the road. 5) once your truck starts to straighten out, shift back into drive and slowly press the gas. At Dillon Logistics, we aren’t just about serious drivers and serious hauling. We are serious about safety. As a result, we are personally committed to living a culture of safety and providing the best workspace and equipment to protect each other. If you have any questions about how to drive through cold conditions, please contact our safety department at 813-853-4864.